There is no better place to count your blessings. 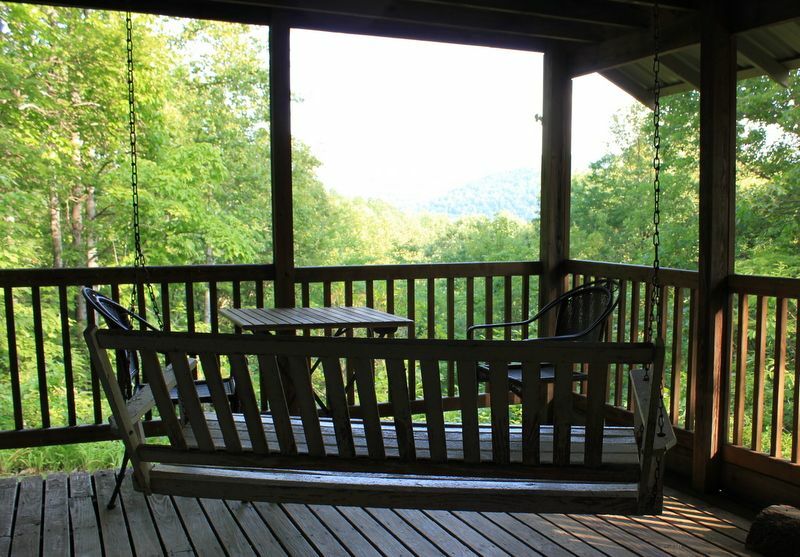 Lay in the hammock or swing on the porch while you experience this magnificent mountain view. Play in the woods or hike down to the waterfalls! The many trails on the property are accessible from your private covered porch. Enjoy moonrise from the hot tub after spending your day shopping in Saluda, Asheville, or Hendersonville, horsing around at TIEC or FENCE, or visiting the Biltmore House. We are nestled into 70 acres of mixed hardwood forest amid creeks, waterfalls and trails. Easily accessed from North Carolina's I-26 or from historic US 176, this 500 square foot 2 bedroom, 1 bath cabin by Cottages of Dark Corner is minutes from excellent biking, fishing, hiking, scenic drives, kayaking, live entertainment, and fine dining. The Pout House is stocked with basic household supplies, soaps and linens for your comfort and convenience. This cottage is located on a gravel drive, easily accessed by car. 4WD isn't necessary. This cottage can be used in combination with two other cottages on our property for your reunion retreat or other larger gatherings; cottages are isolated from each other but can easily be reached on foot or by car. Amy is a knitwear designer and teaches knitting and crochet all over the US, Contact us if you'd like to schedule a learning weekend here in the woods! Amy & Carl live just down the road from the Pout House with their dog Bee, and a cat, Nyenne ("Kitty" for short). Bee has a bad knee and typically walks with a limp. Carl and I usually spend our days somewhere on this 70-acre property, and are here to answer your questions or help you find your way around the area. The acreage where the Pout House resides has been in Carl's family since 1942. Carl began visiting here when he was 2 years old, coming up summers with his grandparents, parents and siblings. Carl and Amy purchased several family shares to combine into this property for everyone to love. Our wish is that it brings joy and healing to those who visit as it has to us for generations. There is a peace here that goes right in to your heart. Carl loves the magnificent views and the breezes. Amy likes that the property is so easy to access from major roads, but still retains the quiet unspoiled feel of deep woods. Both of us just enjoy watching the trees, wading the streams, seeing the wildlife, and wandering the trails with the animals as companions and as guides. We have a small table inside and a large dining table and chairs out on the porch. This cabin in the mountains was exactly what I needed for a few days away from the grind! It was everything I hoped for and more. The cabin is small and cozy, very clean and well-stocked with linens and cooking necessities (even a crock pot!). The beds were comfy and the furniture in good condition. Wifi excellent and solid cable channel selection. The porch ... wow! Wooden swing, large eating table with chairs, rocking chair, and hot tub - I spent almost a full day just sitting and staring at the view (which you can catch from the hot tub as well as from the swing or rocking chair). The grounds were well-maintained and it was obvious that time and love were spent on the little garden path to the house. I plan to stay here again! The Pout House was perfect! Nice hot tub and the house had everything we needed to make it cozy. My wife really loved the views and all the flowers around the house and on the way to the little waterfall down the 10 min easy walk trail. We also had a great guide really friendly dog! Its about a 20 min ride to Sierra Nevada Brewery. Aboslutly want to come back and recommend to anyone! Cabin was small as it states in the description but has everything you could need and was very clean. Great price for a secluded cabin with a view. Loved the visits from “Bee” and she is super sweet and loved giving doggie kisses which we loved. Would stay again if in the area. Beautiful and quaint. Look forward to visiting again. Perfect just what we were looking for!! Thank you very much for your review! We look forward to seeing you again soon. This was perfect for us. Great location and view of the mountains. We loved the trail through the woods that leads to the waterfall. Loved meeting our tour guide Bee on our walk! The cabin was just the right size for our visit. Enjoyed visiting the downtown area of Saluda. We can't wait to visit again. Thanks for everything! Thank you very much for your review! Hope to see you again soon. Local Artists and Art Galleries, Flatrock Theater, Brevard Music Festival, Hendersonville Apple Festival, Farm-City Day, Blue Ridge Parkway, DuPont Forest, 57 area summer camps for kids, on-site arts and crafts instruction and project classes, on-site babysitting, Live Local Bluegrass Music every week, Foothills Equestrian Nature Center (FENCE), McGough Arena (Asheville Agriculture Center) NC Arboretum, Biltmore House, Grove Park Inn, Carl Sandburg Home, Pack Place Museum, Miniature Railroad Museum of Hendersonville, Historic Johnson Farm, Pisgah Forest, French Broad River, Green River, Lake Lure, Chimney Rock, Bat Cave, Pearsons Falls, Sliding Rock, Moonshine Mountain, Piggy's and Harry's Restaurant, Green River BBQ, Purple Onion Fine Dining/Entertainment, Block House Steeplechase, Civil and Revolutionary war historic sites.